This easily-scaleable adventure sandbox draws from the same well as TSR's B3 The Lost City and I1 Dwellers in the Forbidden City. You can play this fresh, though it's real strength comes with a little preparation. Metric: Mirages. A desert-based setting so it's that, camels or biting flies. DISCLAIMER: Based on a PDF review copy provided by Open Design. Overall: 4.5 mirages. The scale of this adventure is magnificent. Many innovative monsters and some cunning twists on familiar encounters make this an entertaining romp. A cleric or paladin is a sensible choice usually but in this sandbox they will be essential given the high damage potential and undead nature of some potential opponents. The city of Kadralhu is sunk beneath the sands of the Ishmai desert. Your party discovers this ancient ruin from an older time. What follows isn't your typical ruined city. There is a lot to explore, the denizens do not simmer in splendid isolation and the presence of the player characters will tip a number of careful balances. The result is that the players will find themselves with plenty to do. The scale of the challenges facing them are appropriate to paragon-characters and there is enough play here to merit a slow rise to epic-scale confrontation. The tropes of the typical 4E game are inverted here with elemental forces running roughshod over imprisoned divine powers. 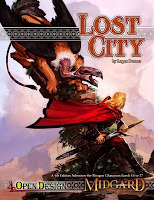 If you want monsters, Lost City delivers. The sand giants (take a giant and give him powers like the Marvel Comics Sandman!) and spectral giants make worthy paragon opponents. The oklu are wonderfully strange, their imprint-based powers showcase 4E's flexibility. A DM will do well to keep oklu statblocks handy and organised during encounters with these strange folk. The parasitic trignotarbs are a great example of monster design. There's plenty of new monsters in each section, like the gypsosphinx, malsalix plants and some unique individuals (a real strength of 4E) including false godlings. Equally, Lost City makes use of established beasts like chuul in innovative environments. Individual adventures are provided in each chapter. The Phoenix Tower is a well-crafted introduction. Impressions reveals the oklu and their society. The Hanging Gardens introduces the trignotarbs on a big scale. The Corpse Commons reveals tensions between oklu and the spectral giants in a necropolis. The Waterworks of Kadralhu is a tour of what ails the city and what can be done about it. Finally the Vaults of Kadralhu reveal the inner mysteries of the city and the challenges that await it's potential restoration. Recurring plot arcs weave between individual chapters with player-friendly markers. Artwork/Layout: 4 mirages (Good stuff mildly let down by monochrome maps). The cover shows a gypsosphinx attacking an adventurer. Layout is crisp with statblocks arranged sensibly yet Some textboxes struggle to contain content. Given the amount of content though this is unsurprising. Corey Trego-Erdner's internal art realises the setting while Darren Calvert's work forms small oases of colour. Cartography by Jonathan Roberts is brilliant for black & white but colour would have made them striking. Thankfully, there is no beige-tinted backdrop for a desert setting. Open Design could provide colour maps for these separately of course (hint, hint). In conclusion, this is a worthy piece from Open Design. Even if you don't play 4E (and edition wars are so... tedious) there are plenty of ideas to mine. Logan Bonner and the team (including Open Design regular Michael Furlanetto, Quinn Murphy (At-Will) and Tracey Hurley (Sarah Darkmagic)) have done impressive work worth your consideration.